Our actual Canada day (July 1) was grim and grey – which is perhaps suitable to our temperament. So I saved up a painting trip for today instead. I don’t know why everyone says Canadians are so friendly. I find us to be a rather pragmatic lot most of the time. BUT – I digress. 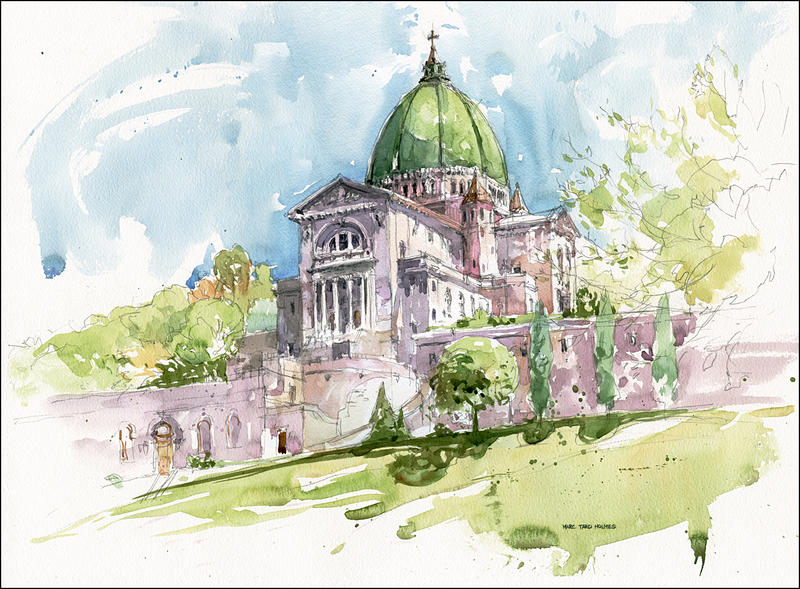 Here’s a watercolor of St Joseph’s Oratory. This white marble edifice is imperiously situated at the top of a steep climb up the north west shoulder of our mountain. After those steps you feel suitably penitent when you arrive for mass. They have a special wooden staircase for those who prefer the traditional method of climbing on hands and knees. I saw at least one visitor availing themselves of this orthodox route. The huge dome on the cathedral is said to be the third largest in the world. But sadly – the interior is quite restrained, (done in a 1960’s flavor of modernism) and does not grant you an uplifting view of the inside of the lofty dome. It seemed oddly understated compared to the baroque grandeur of some of Montreal’s other cathedrals. Perhaps the place is so large I was actually on the wrong floor? Not sure. But for today, my best view was certainly the magnificent approach to the cathedral. Looking up at it from the entrance, hundreds of yards below – it’s quite an edifice. Awesome. And it’s nice to get a little glimpse of your watercolor process. See you in Lisbon in a few weeks! If it was very modern, you were on the right floor (I like it, actually) but I hope you didn’t miss the crypt with its own chapel (much more in the old style) and the chambers behind it with Saint Andre’s tomb, towers of votive candles, and walls hung with crutches…beautiful watercolor, Marc.